Summary: Chelsea thought she knew what being a rock star was like… until she became one. After losing a TV talent show, she slid back into small-town anonymity. But one phone call changed everything. Now she’s the lead singer of the band Melbourne, performing in sold-out clubs every night and living on a bus with three gorgeous and talented guys. The bummer is that the band barely tolerates her. And when teen heartthrob Lucas Rivers take an interest in her, Chelsea is suddenly famous, bringing Melbourne to the next level—not that they’re happy about that. Her feelings for Beckett, Melbourne’s bassist, are making life even more complicated. 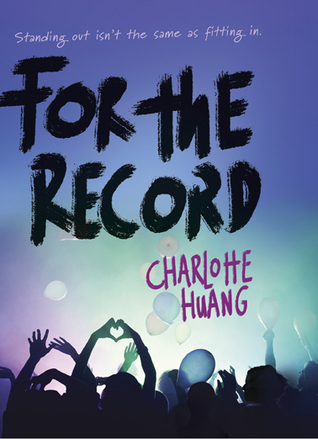 Review: For the Record chronicles small-town girl Chelsea when she joins a band on tour after losing on a music talent TV show (basically, the fictional equivalent of American Idol). She rocks out, falls in love, and gets famous — definitely a roller coaster of sorts. I read the entire book in one sitting, unable to tear my eyes away. The events of For the Record are very much told and experienced in the present, in a linear fashion. The bus goes from one stop to the next, and Chelsea grows as a rock star with each show. The tour details and band drama provide an inside look at what goes on during tours (or maybe not? I don’t know, having never been a teen music sensation). The story is so much in the present, in fact, that references to Chelsea’s backstory — that she was ostracized in high school, starred in an American Idol equivalent, and then signed on to replace the missing lead singer of the band Melbourne — ring almost hollow. It felt like there was an entire prequel missing, and I’d been thrown into the middle of something. Chelsea’s backstory, her history with her best friend Mandy, and her crush on Beckett all felt like facts told to the reader. I hate to trot out the tired old cliche of “show, don’t tell,” but it feels relevant in this case. This is definitely a read that reels you in, but only if you can manage to suspend your disbelief when it comes to character motivations and the like. The drama and non-stop grind of show after show keeps you reading. Still, when I finished the book, I couldn’t say for certain that I understood any of the heroes of this story. If you’re into rock-n-roll band stories and the lives of the famous, definitely pick up For the Record to read sometime.